Preheat oven to 425 degrees. Prepare pasta in a pot of salted water according to directions listed on package, reserve 1/4 cup of the water before draining. Toss tomatoes with 1 Tbsp olive oil and season with salt and pepper to taste. Spray a baking sheet with non-stick cooking spray and spread tomatoes into an even layer on baking dish and roast in preheated oven 10 – 15 minutes, until soft. In a food processor pulse together basil, garlic and pine nuts until minced. With processor running, slowly pour in 6 Tbsp olive oil in a slow stream. Pulse until finely minced and well blended. Add in parmesan cheese, season with salt and pepper (about 1/4 tsp of each) and process about 1 minute longer. Toss drained pasta with pesto and a few tablespoons of reserved pasta water as needed. Season with salt and pepper to taste. 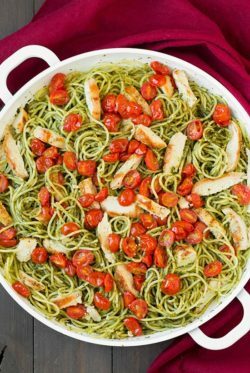 Top with chicken and cherry tomatoes. Sprinkle with parmesan and optional red pepper flakes to taste.